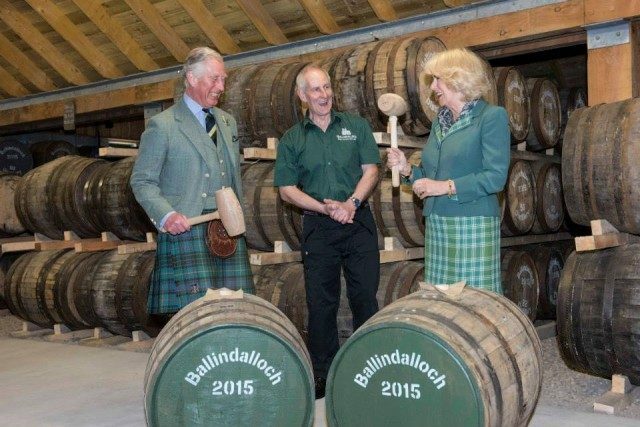 The prince of Wales and Duchess of Cornwall unveiled Scotland’s “first” single estate Scotch whisky distillery, Ballindalloch, in April 2015. Wearing what appears to be the exact same kilt-and-blazer combo from his Glen Grant visit, Charles, joined by Camilla, met the founders and team members of Ballindalloch, as well as local dignitaries, for the opening. The Duke and Duchess spent over an hour at the distillery, during which they unveiled the site’s commemorative plaque and fitted bungs into two casks, the whisky from which will be bottled in 2025.